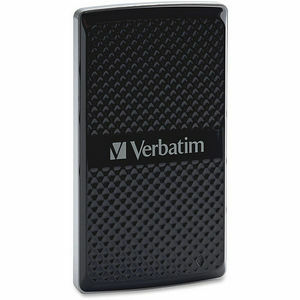 Lightweight, fast, compact and durable, Verbatim's 128GB Store 'n' Go Vx450 external SSD provides the latest in external data storage options. Offering data transfer rates up to 450MB/sec, the Store 'n' Go Vx450 external SSD is ideal for users that demand maximum performance in data storage devices. With USB 3.0 connectivity and an internal mSATA interface, the Store 'n' Go Vx450 handles large data transfers quickly - ideal for video editing, interchanging large amounts of data, or maximizing gaming performance. The Store 'n' Go Vx450 external SSD operates silently and features low power consumption for extended laptop battery life. The Vx450 external SSD is 100% compatible with USB 2.0 and is backed by a 2-year limited warranty.